With the TX3 complete, a shed full of spare parts to clean out, and a lack of anything to do on any of my other cars (except a shifter cable swap on the AW11, which I can now proceed with as the new bits have arrived) I decided to kill my boredom and get rid of some of those parts by purchasing a wee little 1985 BFMR Mazda Familia in need of some sorely required maintenance. In the seller’s own words, “the engine shat a brick about two years ago, and it’s just been sitting in my garage doing jack since then.” I know a challenge when I see one. yeah I can’t seem to stay away from the damn things – as anyone who reads my numerous blog posts about them can tell you – but surprisingly enough this is my very first proper BFMR, having owned a BFMP and BF5S in the past. This isn’t taking into account the TX3s of course, but since they’re the exact same car, all of my expertise carries over, which makes this a fairly easy walk in the park. currently the plan for this car is to undertake as close to a factory-standard restoration as I can manage without going too overboard a la TX3. With fewer and fewer BFMRs left in this country it makes sense from an enthusiast’s (and possibly investor’s) point of view. So… presenting the new summer project! After an 18-hour tow mission to Masterton and back (thanks Gareth and Stefan for the help and company, and Sam for the use of his truck for towing duties) and a slight mishap getting it into the garage which saw the bonnet and front bumper kiss the wall at 10km/h (what is it with my cars getting intimate with houses? 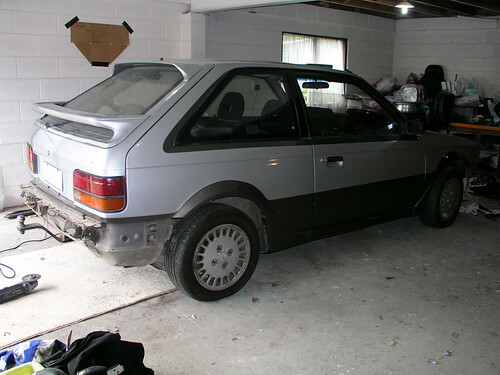 Srsly) the BFMR is now parked up and ready to be restored. 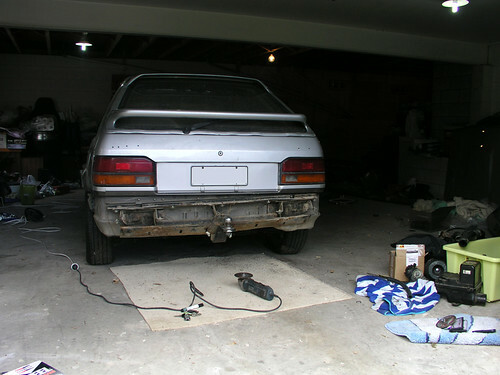 You’ll notice in the photo above the rear bumper is off – in the process of removing that godawful towbar. Apart from the slight damage to the front caused by my carelessness, the rest of the body is in pretty decent condition and should come up good with a wash and polish. There seems to be almost no evidence of rust anywhere, apart from a tiny bit of surface stuff in the bottoms of the doors, sunroof and what-have-you. Still, not bad for a 25 year old car and is an obvious testament to careful garaging by previous owners. See those dash vents, and that instrument cluster surround? Yeah, they used to be a yucky silver colour. Factory grey/black is FAR more appealing. 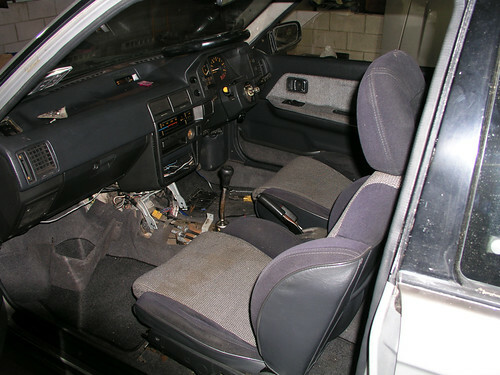 Observant readers who can still remember my last TX3 project update may notice that the front seats in this are those blasted BFMP ones that sit on a lean… deja vu much? Here’s hoping I won’t be spending years tracking down a pair of proper BFMR ones, just like what happened with the TX3. So anyway, the next step is to turn my attention to the engine, which is currently missing most of the intake piping, the rocker cover/distributor and some other ancillaries. Some of the parts are currently sitting in a large box in the boot, and others (like the rocker cover) are just plain missing. Fortunately I have the means to replace anything that does end up AWOL, such is the extent of my spare parts collection! The next project update will feature some theories as to what could be wrong with the engine, and steps David and I have taken to eliminate some of the possibilities. I’ve got a slight hunch that whatever went wrong was not an entirely catastrophic event. Time to take a grinder to that ugly arse towbar!